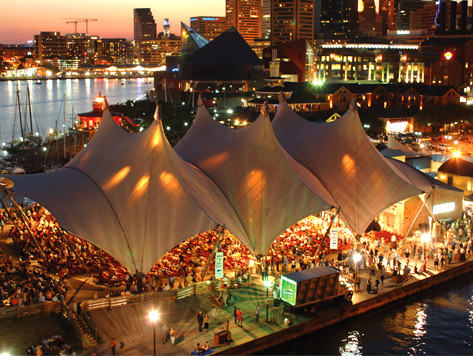 With breathtaking views of Baltimore’s Inner Harbor, Pier Six Concert Pavilion is considered one of the most beautiful outdoor live entertainment venues in the country. Since its inception in 1981, the Pavilion has played host to some of the biggest names in the entertainment business, ranging from rock to jazz. The Pavilion is within walking distance to many popular downtown Baltimore attractions, including the National Aquarium, Maryland Science Center, and Power Plant Live. Pier Six Pavilion parking is available at any of the convenient parking garages featured on this page. The Little Italy Parking Garage offers daily rates and is a short stroll from the venue.